I guess I'll just skip ahead with my story as I wait for @Arceus8523 's segment. Now able to use Beirani, Kyoniq’s entourage had certainly grown. Fei’wet, Seira, the fluidform, and now the lammasu walked beside him. They were about to set off towards the tower, having stayed at an inn in the town of Dei. However, Kyoniq couldn’t stop thinking about the first spell that Archie and Estus had thrown. That ball of fire could have dealt real damage if it had hit him. Kyoniq wasn’t prepared. He wasn’t protected. Kyoniq sat on a painted bridge over a stream behind the inn. 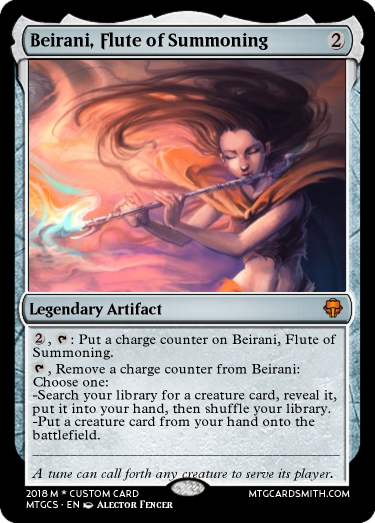 Absentmindedly, he began to play Beirani, letting its magic take him away. He looked down and saw something swim by him in the water, catching the moonlight. It had a cylindrical body and eight trailing arms. A squid. Beirani created a kind of bubble of virtual reality, making Kyoniq feel like he was underwater. Squid swam all around him, bright pink in color. A massive squid, bigger than Kyoniq, drifted into view. Kyoniq bonded with it, then strengthened the bond until their minds became one. Cephalopods have strange minds. They are intelligent, yet their thought pathways are alien to warm-blooded creatures like Kyoniq. 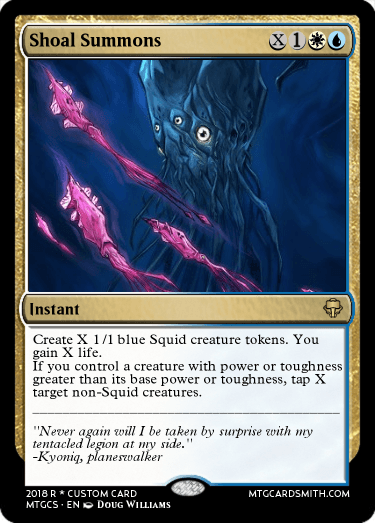 The aven planeswalker felt the squid attached to him. He was their master now, and they his army. Kyoniq drifted back into reality, but everything was not the same. When he looked closely at a patch of air, it seemed shimmery like water. Experimenting, Kyoniq reached out with his magic. The air shifted, and a few squid darted through it. Kyoniq suddenly couldn’t tell if he was on a bridge during a warm night or deep in an underwater haven. 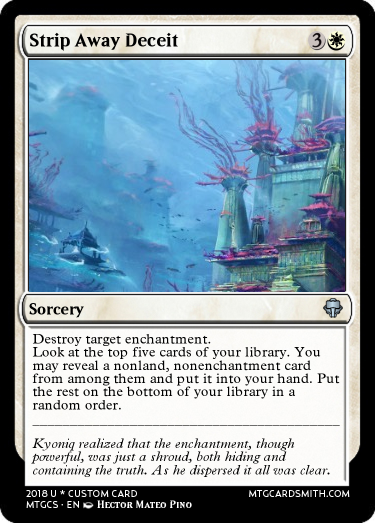 Kyoniq reduced this spell, and the air returned to normal. He finally settled on his default – the squid were not manifested physically, but served as a sort of mental field alerting Kyoniq of danger and ready to pop out of the aether at a moment’s notice. A smile – or the aven equivalent of one – touched Kyoniq’s face. “Never again will I be taken by surprise with my tentacled legion at my side,” he whispered. Kyoniq stepped off the paper lantern-adorned bridge. Tomorrow he would leave to find his destiny. For the Planeswalker's Heritage challenge, I choose Option B.
ouch. My feet decided that today was a great day to loose grip when I was out carrying stuff. With other words. My back hurts and my vision is somewhat blurred. I will make the announcement of elimination and begin next challenge when I'm able to get out of the bed. Sorry for the inconvenience. @Jonteman95 looks like the snake got hit by some rocks. Hopefully it doesn't get any better! In all honesty, though, I hope you get better soon! It's not my health just my back that is in pain. However the worst is gone now but it is still hurting upon movement. More information regarding the factors follows in the challenge description. You can hear how the walls and/or roof of the dungeon/ruins crack and dust falling to the ground. Something is crawling on the other side, something large. "Voices singing in forgotten but found paths of old voices. Voices two now silent are too. Six remain for the desolated path they now must run as the world becomes so small. For only five shall enter the land of the seven rings. We shall follow your every step for we are I and I am nightmare." The crawling sound moves on further along the path until it disappears beyond the shadows. * A few moments later a sound of a breaking rock can be heard followed by the sound of the snake. "OUCH!!" Septim Vulganos has been silenced and sent home. Archie, Voice of Strength/Estus, Voice of Reason has been silenced and sent home. It was not long ago I thought you two would be among those that reached the tower. You two have sadly been eliminated this week. I hope you'll continue to have fun and feel free to continue following this journey if you would want to. You were for a long time the top player and when you weren't. You were still very close to the top. You had the highest score percentage of everyone. Your cards required much work and it was seen in the points. Sadly you made very few cards of higher rarity and thus had the lowest potential maximum. Five remains as we enter the last arc of this journey. Saved and unused resources won't do you any good from here on. From here on I won't show the rankings anymore. Since you are very few so the ranking may only give a wrong interpretation. Also the cards you will receive from here on are limited to their respectively challenge. Here is what slots you have used and what you have in total. Please correct me if anything of this is wrong. 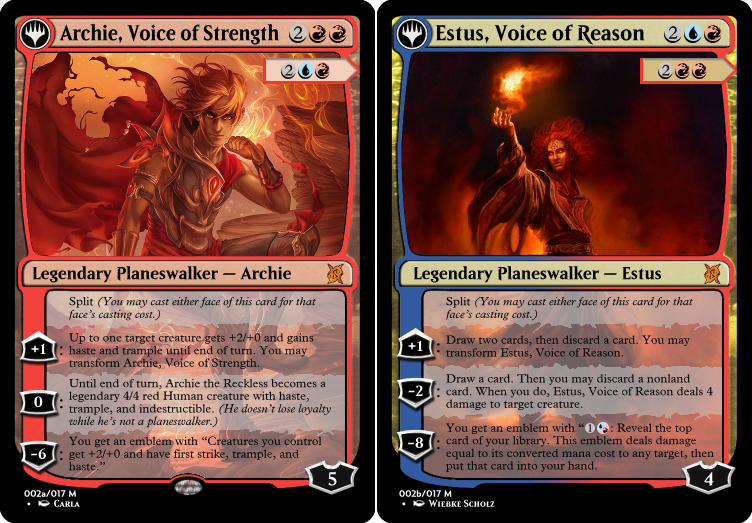 "Only a few planeswalkers still stand but those that do have gained exceptional powers. 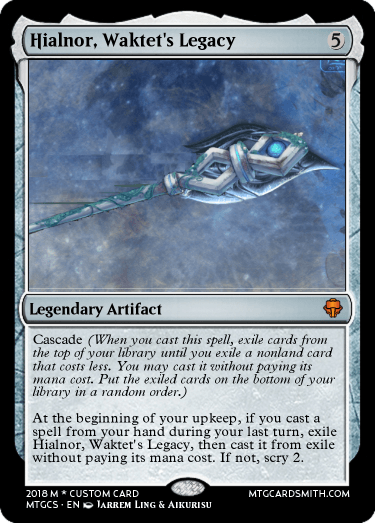 Wielding an artifact or enchantment of a long gone planeswalker that fell many many years ago they make their way towards their destination. The tower and the seven rings. The sun moves in the sky just above the tower's top. The planeswalkers have come so far that they now can see the huge forest in the horizon, the border to the land of the seven rings upon which the tower casts its shadow. But the land between you and the rings shall not be underestimated. The last settlements of civilization has now been left behind and a true wilderness is between you and the circles. A land hostile to all but those that can stand against it. The last land upon which the most powerful of mortals have traveled, towards the rings where they all have finally met their journey's end. Are you mortal or are you a true planeswalker? Shall you take the right to enter the land of seven rings where no mortal have entered? Or shall this land be where your journey ends? No matter what. You better move." Survive until you reach the land of seven rings. In this challenge the penalty due to curve factor and cover factor will be increased significantly. This is the lesser of the two factors. This is more or less the mana curve of your spell book with some changes. 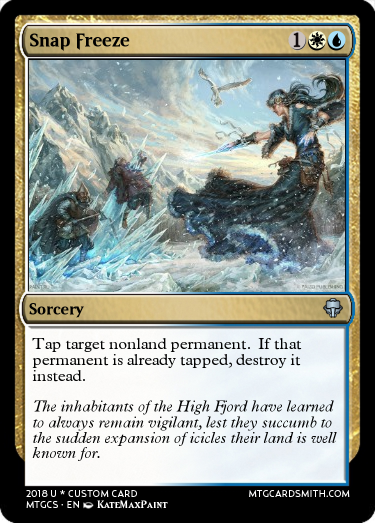 Its much closer to a mana curve of a commander deck than any other kind. You could say. 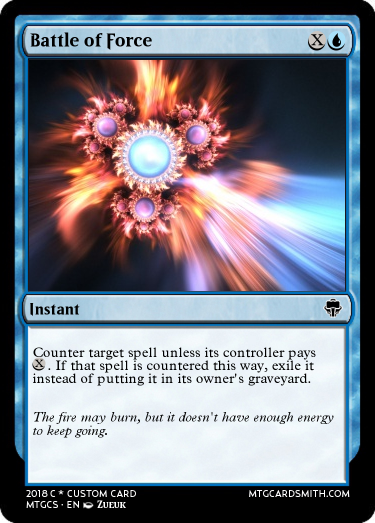 A commander deck's mana curve but more epic. You should be able to cast spells in all sections of the game. You should avoid sudden drops and sudden peaks. This is a mediocre curve. 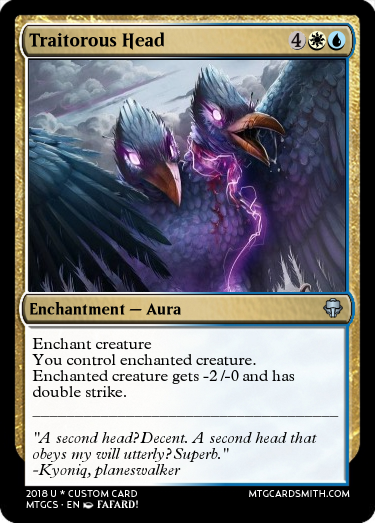 I have too little 1 - mana spells or too much 2 - mana spells. Also I have a sudden drop from 4 to 5 mana which makes me lack end game options. 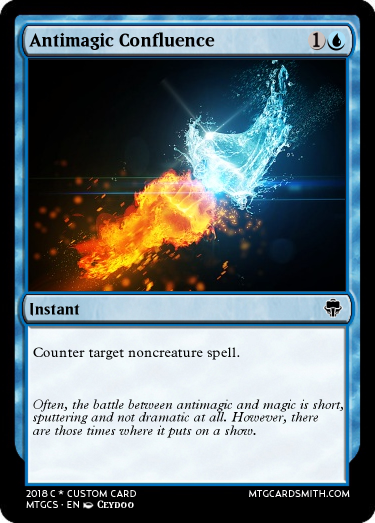 However mana sinks can be used to even out the curve. So in other words. Curve factor is the flow within your maximum cmc from low to high. This is the lesser of the two factors and should just be checked so it is not chaotic. * You should have early, middle and late game options. * The mana curve should avoid sharp peaks and dips. You could just build a rectangular box if you want and it would work if the first point is fulfilled. If I made one more 1- mana card and one 5, 6 and 7 mana card it would work. This is the major one. This is in general what your spell book can and cannot do and how well it can do these. Can i deal with threats? 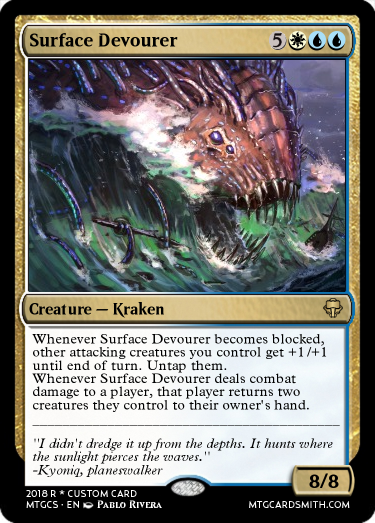 Can it deal with protected/indestructible creatures? Can it deal with tokens? Can it provide with creature? Can it provide with threats/bombs? Can it manipulate the draw? 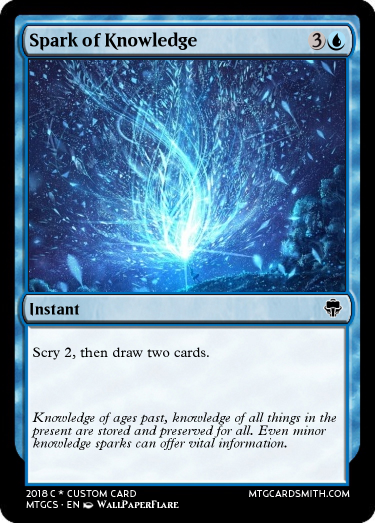 Can it draw additional cards or scry or search the library? 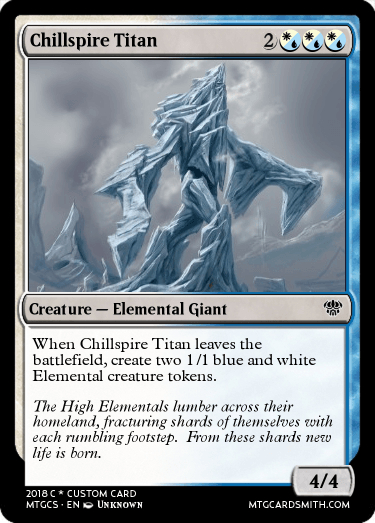 Can it protect your creatures, planeswalkers, other permanents? Can it use the graveyard? Can it stop other player's graveyard shenanigans? But also. Does it need to? You should not try to fix all of these because you cannot. You should however make sure that you are not trapped because of something, either by removing it or bypassing it. Since this challenge was postponed I will postpone the end of it to Tuesday 17:00 CET. @Jonteman93 So you're just going to take another week and eliminate another pair while we just sit here, unable to impact anything? NNNNOOOOO @Arceus8523, you could’ve done it!!!! @ShaperKyon People can still use their unused slots to create cards. That's why I warned about "There is uncertainty of your future. Make sure you are prepared." and told you guys to look through your spell book in case something's missing. I'm sorry if I caused bad confusion or mislead you. That was not the intention. This challenge was made to mix up the entire formula. However if you guys don't like it then we could replace it with a "normal" challenge or remove it entirely. You should have at least a reasonable amount of low, mid and high cost/power spells. You decide if you want to focus on a low, mid or high curve regardless of your cards' strategy. 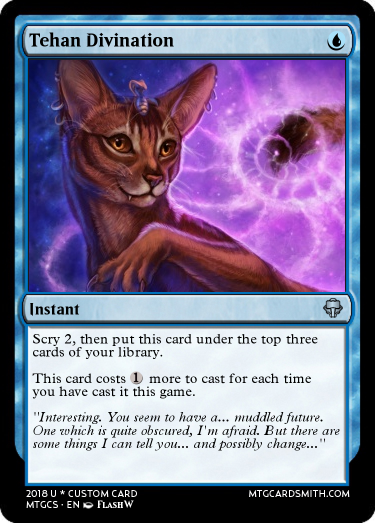 You won't be penalized unless the mana curve have obvious flaws. So if you look at the curve and think "this is reasonable" then it won't penalize you or the penalty will be very low. Only a bad or worse curve will have penalty but those will have rather high penalty instead. You cold say that it is rather exponential. Cover factor is more linear -> logarithmic in its penalty. @MonkeyPirate2002 I'ts supposed to be a metaphor. Edit: I should probably have waited for the painkillers to calm down before I wrote this challenge. I've had too much going on IRL to be able to invest into this. Man, I'm running out of resources. Hopefully there will be some refueling in the near future! And yeah, this does take a lot of time. @Jonteman93 I think the sheer amount of cards you need to design is hard. I think if you required less cards, this contest would highlight the best designers rather than the designers with the most time. @Ranshi922 has lost a second time. Anyone else think it's weird that, in the top 5, 3 of the planeswalkers are specifically Blue/White, and all of the finalists have at least Blue? The latest non-blue player was DoctorFro. 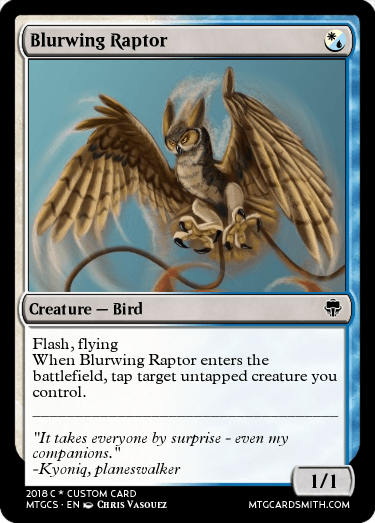 But... but... my favourite MTG colour of magic... I don’t own a deck without blue in it!